Great Home Time | Bonuses EVERY 90 Days | Certified Top Pay Carrier! •	We will fly you from home to a specially equipped newer truck at one of our terminals. •	You run for 30 days and we fly you home to take 15 days off with your family/friends. SOLO: $1,500 on your first check PLUS eligible for $725 or $550 CSA Bonuses and Paid Time Off (Vacation) at 30, 60, and 90 days. TEAM: $2,000 each on your first check PLUS eligible for $825 or $650 CSA Bonuses and Paid Time Off (Vacation) at 30, 60 and 90 days. 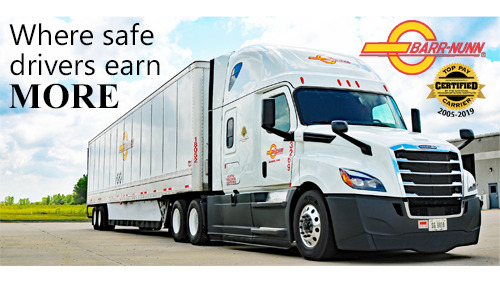 Contact a Recruiter at 888-268-6612 or visit barr-nunntruckingjobs.com to learn more!